Whilst the majority of our students attend school each day with excellent uniform there are still a few who struggle to reach the expected standard. 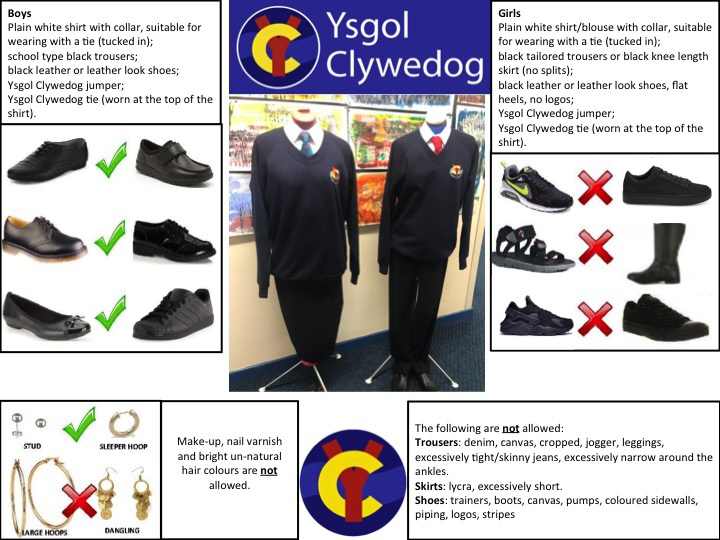 There have been some anomalies regarding some aspects of the uniform, eg trouser styles, length and type of skirts, colour and type of footwear, hooded tops. This letter will hopefully assist in helping to obtain a level of consistency about what the uniform should be. The school appreciates that there are some circumstances that cannot be foreseen and therefore having the correct uniform may be difficult (a lost jumper, for example). However, the expectation of wearing full and correct uniform on a daily basis is still one of the standards that the school expects. Wearing a school uniform instils pride and a sense of identity. It helps to establish the correct mind-set, where students are ready to learn. This is a pivotal part in ensuring that your child can get the most out of their learning, rather than staff challenging basic expected standards such as uniform. It also helps in preparing young people for the workplace where often uniform and strict standards are enforced. Should a student be found to have the incorrect uniform, it may be necessary you are contacted. In extreme cases your child might be sent home to make the necessary amendments to their uniform before returning to their studies. As a parent/carer your assistance in enforcing the uniform policy is always gratefully received. Students should not need to lose valuable time away from their education to address situations regarding any uniform issues if they are correctly attired and presented. If you have any queries regarding any of the above please do not hesitate to contact the school.